Energy efficiency is the big deal these days. If we use less energy, not only we save the energy but we contribute towards lesser pollution too. After all, the greenest energy is the energy you do not have to produce. As a responsible citizen of this earth, if I wish to use lesser energy than I am using now there are few things I can do. I can buy a car which has better mileage than my present car. So even after running the same distance, I have now used less fuel than the last month. Ship energy efficiency is not much different than this. 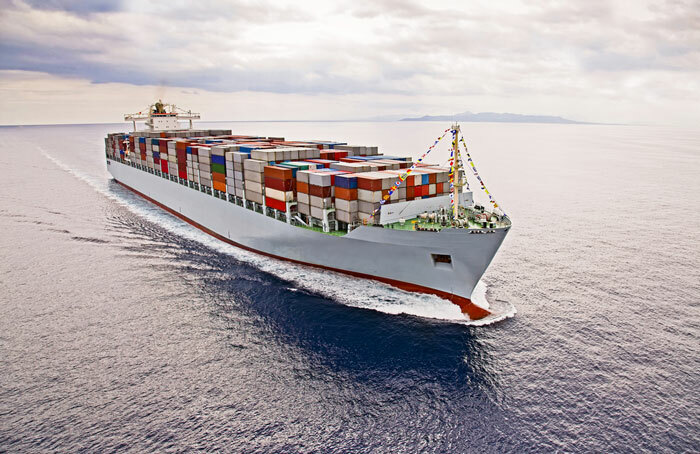 For a very long time, ship energy efficiency was voluntary and ship owners were expected to understand their responsibility towards energy efficiency. However, IMO felt a need to make the concept of “energy efficiency” as mandatory and thus the Annex VI of the MARPOL was amended to include chapter IV for ship energy efficiency. In this post, we will discuss everything we need to know about the requirements of the ship energy efficiency. When we talk about energy efficiency, there are not one but many way by which this can be achieved. As I used the example of using a car. We can buy a hybrid car. We can get the car serviced at regular interval so that it continues to be at its best at all times. And we can use the car only when it is required. All these are the ways for using our car in energy efficiency ways. For ship energy efficiency, the terms used may be different but a parallel can be drawn with these examples. Here is what the concept of ship energy efficiency looks like. When a vessel complies with these requirements, the ship is issued a certificate named “International energy efficiency certificate”. Let us discuss all these terms in detail. With the concept of EEDI, the aim of the IMO is to have the ships fitted with engines and equipments that are less polluting. EEDI is the measure of the amount of CO2 emitted by the ship per capacity mile (tonne-mile). Let me explain the term “tonne-mile”, just in case you have not heard it before. Tonne-mile is the unit of work done by a ship. Let us say that a ship with deadweight 20000 T travels 2 NM. It has done 40000 tonne-mile of work. Now coming back to EEDI. EEDI is the amount of CO2 emitted by the ship (in grams) per tonne-mile of work. As the name suggests, EEDI is the tool that is used during the design or construction stage of the vessel. MARPOL Annex VI, Chapter 4, Regulation 21 provides the formula for the required EEDI. Understanding the calculation of reference line value is complex. But if you wish to understand how the reference line value is calculated, you can go through the Resolution MEPC. 231(65): 2013 guidelines for calculation of reference lines for use with the energy efficiency design index. Over the period of time, IMO wants to reduce the required EEDI value for the ships so that in future the ship’s engines are even more energy efficient. 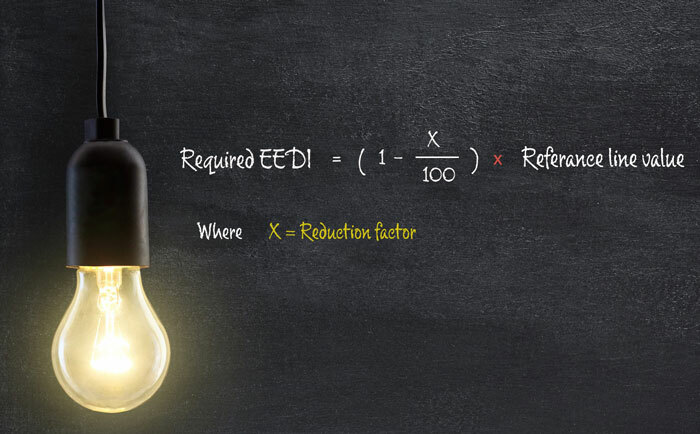 For this, the regulation uses the “reduction factor” in the calculation of the required EEDI in different phases. We are now in phase 1. 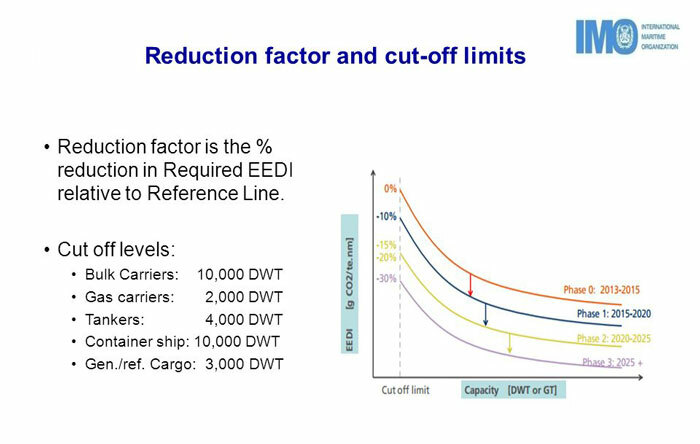 This means that for any ship built today, the required EEDI value will be 10% less than the reference line value (required EEDI value in phase 0). We know what is required from the vessel (required EEDI) with respect to the energy efficiency. We now need to know the actual EEDI value (Attained EEDI) of the ship. And when we have that value, the attained EEDI need to be less than the required EEDI. Again the formula and process to calculate the attained EEDI are complex and we do not need to go in that direction in this blog. But if you are interested to know about it you can go through the resolution MEPC.245(66) IMO Guidelines on the calculation of attained EEDI. 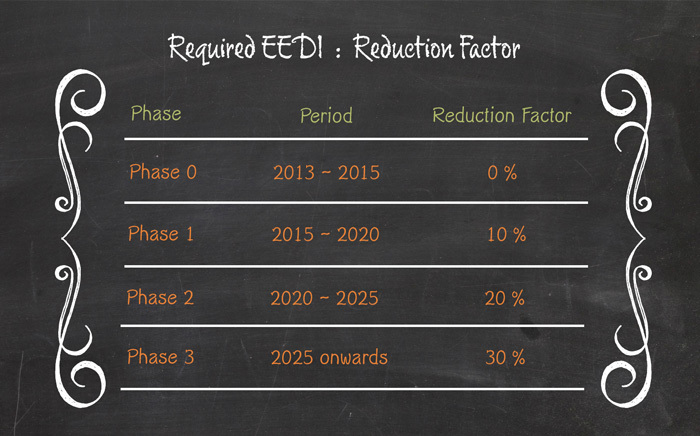 Here are few factors on which the actual EEDI value of the ship (attained EEDI) would depend upon. For producing the same amount of power, if an engine uses less fuel it would be more energy efficient as it would emit less CO2 too. Specific fuel consumption is the measure of fuel consumed for generating a unit of power. So attained EEDI would depend upon the specific Fuel consumption of ship’s engines. If the engines and other equipments work on fuel that produces less CO2, the vessel will be more energy efficient and will have lower attained EEDI value. If the ship makes more speed with the same amount of engine power, the ship will be more energy efficient. Higher ship’s speeds mean lesser attained EEDI value. If the ship uses some innovative technology that reduces the wastage of the mechanical energy produced or that increases the efficiency of the engines, the ship would be more energy efficient and hence will contribute towards lesser attained EEDI value. Above are only few factors and calculation of attained EEDI uses many other factors. If we need to calculate the EEDI value for the engines fitted on board, many parameters related to these engines would be required. All these parameters are provided in a booklet called “EEDI technical file“. Marpol Annex VI, chapter 4 requires that each new ship for which chapter 4 is applicable need to be provided with EEDI technical file. EEDI technical file is first created during the design stage of the vessel. During the design stage, a model test is done and the EEDI is computed on the basis of that. A verifier (usually classification society on behalf of the flag) witnesses the model test, verifies the EEDI computation and reviews the initial EEDI technical file. During actual sea trials, the actual parameters are measured and EEDI technical file is revised if required. 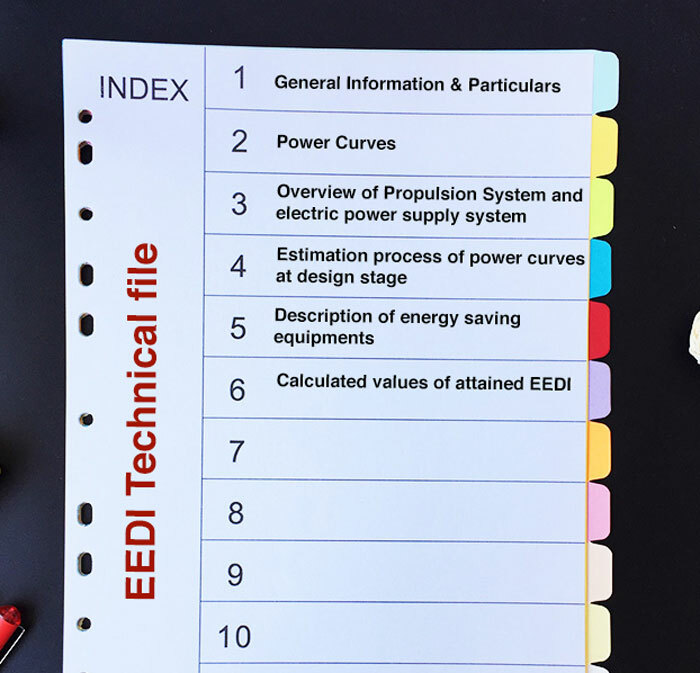 The attained EEDI value is also calculated based on this revised EEDI technical file. EEDI deals with the hardware part of the energy efficiency. With the concept of EEDI, the new ships will now have energy efficient equipments that would generate lesser CO2 to the environment. But having the good equipments is not the only way to be energy efficient. There are many ways that are related to “how we operate the equipments and not on “What equipments we have”. For example, it is more energy efficient to run two auxiliary engines at higher loads than run three auxiliary engines at lower loads. Or it may be more energy efficient to take longer but good weather route than to take shorter but bad weather route. There could be hundreds of good practices that can save fuel and thus emit less CO2 to the environment in transporting the same amount of cargo to the same distance. SEEMP is the plan of all such practices that can be performed to achieve better energy efficiency. 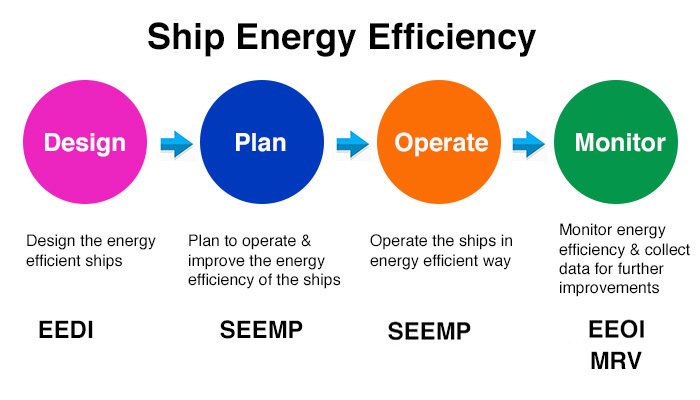 Ship energy efficiency management plan (SEEMP) is a ship specific plan that provides a mechanism to improve the energy efficiency of a ship in a cost-effective manner. 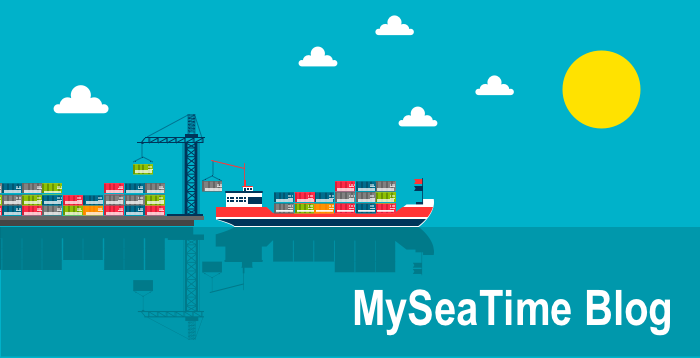 SEEMP has been made mandatory for all ships as per Marpol Annex 4, regulation 22. MEPC 280(70) provides the guidelines on the development of ship energy efficiency management plan. SEEMP is divided into two parts. The first parts list the ship specific measures that have been adopted by the company to improve energy efficiency. It also defines the responsible person for each adopted energy efficiency measure. SEEMP can provide the ship specific way in which the ship operations can be carried out in a fuel-efficient way. SEEMP may suggest the master to take into account the guidance provided by the weather routing services that the company has subscribed to. A well-maintained engine would give optimum efficiency and save fuel. SEEMP may suggest completing the PMS jobs of engines on time. The consumption of the auxiliary boiler is significant. By smartly managing the use of boiler, a significant amount of fuel can be saved. Some companies have preferred to install electric heaters for fuel heating to further reduce the need for boiler and thus saving fuel. SEEMP may provide the ship with specific ways to use the boiler efficiently. With the same deadweight, a ship at different trim may consume a different amount of fuel. Many companies conduct tests to get to know the optimum draft and trim for each ship. 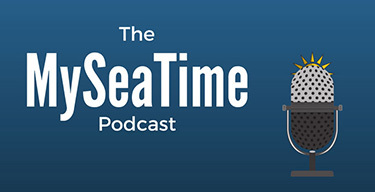 SEEMP can suggest the ship specific draft and trim to maintain (whenever possible) for less fuel consumption. A clean propeller and clean hull offer lesser resistance and thus better fuel efficiency. SEEMP can include the plan for regular underwater hull inspections and cleaning of hull and propeller. There could be hundreds of such measures that can contribute towards energy efficiency of the vessel. Out of these hundreds of available measures, SEEMP part 1 need to define what all measures the company has adopted for that particular ship or fleet of ships. Part 2 of the SEEMP is applicable for the ships of 5000 GRT and more. From the calendar year 2019, each ship of 5,000 gross tonnage and above shall collect the data specified in appendix IX to the Annex VI of MARPOL, for that and each subsequent calendar year or portion thereof, as appropriate, according to the methodology included in the SEEMP. Below is the data that is required to be collected and submitted to the IMO through flag state. SEEMP part 2 clearly provides the specific guidelines on how this data needs to be collected. For example in the case of fuel consumption, SEEMP part 2 would need to define how the fuel consumption need to be measured? Do ship staff need to use the flow meter readings to note down the consumption? Or do they need to use the opening stock + supply as per BDN – Closing stock to get the consumption? 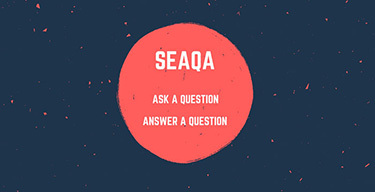 The idea for the methodology of collecting data in SEEMP part 2 is to have the uniform way of collecting data. SEEMP encourages the ship managers to monitor the energy efficiency of their ships. There could be many ways and tools to monitor the energy efficiency. EEOI is one of such monitoring tool suggested by the IMO. The use of EEOI as a monitoring tool is voluntary and ship managers can use any other monitoring tool if they wish. 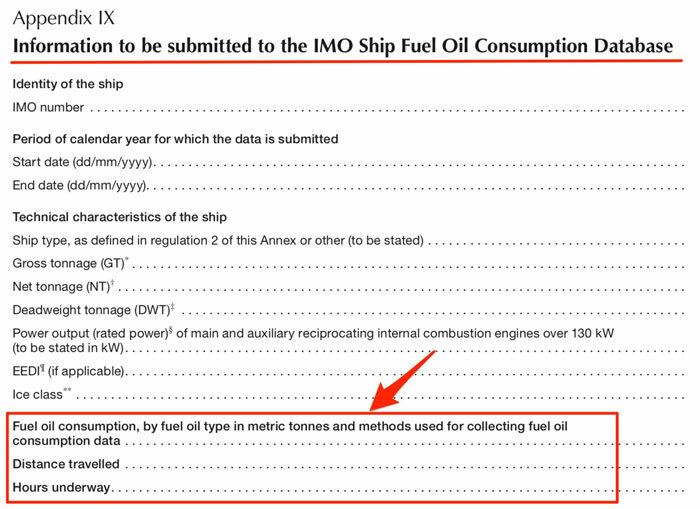 In simplest of the terms, EEOI is the amount of CO2 emitted by the ship per ton-mile of work. 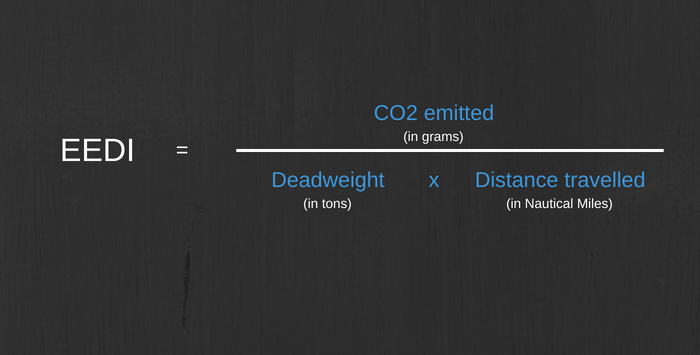 So, it is the ratio of the CO2 emitted to the ton-mile (amount of cargo x distance covered). But we could only know the amount of fuel consumed by the vessel. To know the amount of CO2 emitted from the fuel, we use “fuel mass to CO2 mass conversion factor”. Each type of fuel is given a conversion factor. The amount of fuel consumed when multiplied by this conversion factor would give the CO2 emitted by use of that fuel. EEOI is a voluntary tool for measuring the operational energy efficiency. IMO MEPC.1/circ 684 Guidelines for voluntary use EEOI provides the guidelines for voluntary use of EEOI. Most of the companies measure EEOI for each ship and for each fleet every 3 months. Companies may have set the KPI or a target for reducing the EEOI number of ships. Both EEOI and EEDI measure the same thing which is the energy efficiency of the ship (the amount of CO2 emitted per tonne-mile). So what is the difference between EEOI and EEDI? This is one of the confusion that a lot of people have. The difference between these two terms is that EEDI is the measure of energy efficiency of the ship by design and EEOI is the measure of how efficiently the ships are operated. EEDI is how well (energy efficient) a ship is built. EEOI is the measure of how well (energy efficient) a ship is operated. Apart from that in the calculation of EEDI, the ship’s summer deadweight is taken into account whereas EEOI calculates the CO2 emitted for actual cargo carried during that period. So two sister ships will have the same EEDI as all the equipments and parameters will be same for both the ships. In short, While the EEDI of two sister ships will be same but the EEOI for the sister ships may not be same as both the ships may be operating in different ways. The one being operated in energy efficient way will have lesser EEOI for that period. As per MARPOL Annex VI regulation 6, an “International energy efficiency certificate” need to be issued to all ships of 400GRT and more. This certificate is endorsing few facts. One, if the required EEDI need to be known (as it is not required for existing ships). If yes, then what is the required value of EEDI? Second, if the attained EEDI need to be known (as it is not required for existing ships). If yes, then what is the attained EEDI value? And finally, if the SEEMP and EEDI technical file are provided to the vessel. The concept of ship energy efficiency is related to the emission of CO2. There are four terms that define ship energy efficiency. EEDI, SEEMP, EEOI and international energy efficiency certificate. Energy efficiency design index (EEDI) defines the energy efficiency of the ship by design. It is the ratio of CO2 the ship would emit per ton-mile of the work done by the ship. 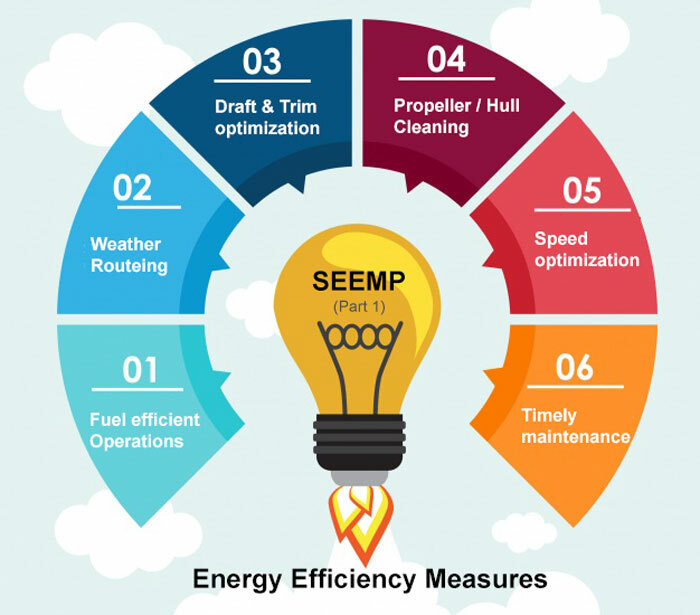 SEEMP is a ship specific plan that provides the ship specific measures that need to be implemented for energy efficient operations. Energy efficient operation index (EEOI) is the voluntary monitoring tool provided by the IMO to measure and monitor the actual CO2 emission per ton-mile of transport work done by the ship. International energy efficiency certificate endorses the fact that the vessel complies with the energy efficiency regulations applicable to the ship. Very Useful and informative again, thank you captain. You r the number one. Dear Capt Rajeev. You are the kind of teacher or instructor which a good training institute must have. Iam really impressed with the way you provide your knowledge in simple and nice manner that anyone can understand easily. Your blogs are really good and informative specially to junior officers who are looking for answers and appearing for exams. Please continue doing the good work. You are doing a fabulous job honestly. We mostly meet people in shipping too scared to share their knowledge you are right opposite..Kudos!!! The ideas and details are so clear after going through the topic .. such a brilliant job .. The flow charts gives a better idea even before going through the relevant text .. Awesome work sir and I would love to keep reading your blogs throughout my career .. Thank you so much for this wonderful job. Many thanks for this explanation captain , a small correction '''SEEMP has been made mandatory for all ships as per Marpol Annex 4, regulation 22.''' Annex 6 and not Annex 4. The full form of EEOI is "Energy Efficiency Operational Indicator" and not "Energy Efficiency Operational Index". Contents of the material otherwise are commendable. Easy to understand... thank you sir..
Best and easy explanation so far on any website. Thank you very much Sir. Your explanation is so simple and easy to understand.